Spoilers for anyone not caught up on The Blacklist. The life of Raymond Reddington has never been an easy one, but things got ridiculously complicated for him last week, when Liz was (seemingly) killed off during childbirth. 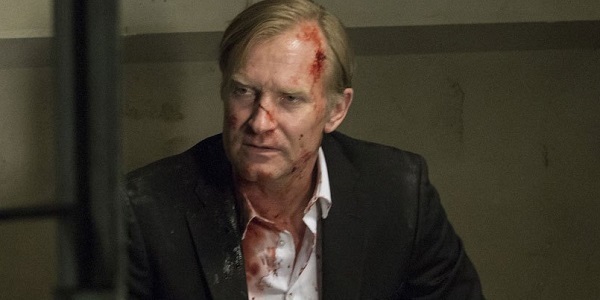 And that void in Red’s life is going to be filled soon, though probably not how he’d like, as the show just cast Banshee star Ulrich Thomsen to play a new villain that seems to know The Blacklist’s central informant better than anyone, which makes him extremely dangerous. When he joins the show during the final episodes of Season 3, Ulrich Thomsen will be playing the international businessman Alexander Kirk, who has charisma to spare, despite being a hermit of the highest order. Having gained his massive success and wealth running a global energy company, Alexander will use every advantage and resource he can muster in order to take down Red, with whom he’s been feuding for years. You see, Alexander and Red go back a ways. According to EW, their history is one in which dishonesty and backstabbing are not rare commodities. The new baddie is also tied to one of Red’s most personal and surprising secrets, so expect to learn a couple of new things that might skew your opinions of James Spader’s crafty criminal. Place your bets on what you think that reveal will involve. It makes sense that The Blacklist would want to bring in a new threat to carry the narrative in a different direction now that Liz won’t be around. Season 4 is coming later this year, so hopefully Ulrich Thomsen’s Alexander Kirk is both interesting and devious enough that he can stick around for more than just a handful of episodes, especially considering it would take way longer than that (even in TV time) to take Red down. For all four seasons of Banshee, the Danish actor has been solid as the morally unkempt Mayor Kai Proctor, which is probably his best known role to American audiences, but that show is ending this year, so that’s another reason we want his Blacklist gig to last . You also might know him from Johnny Depp’s Mortdecai, but probably not. Lots of changes are possibly happening with The Blacklist, as NBC is planning on giving it a spinoff, via an upcoming backdoor pilot, that will follow Tom Keen and Famke Janssen’s Scottie Halsted doing things that are assumedly covert. But before either that or any new character introductions get to happen, we need to see the aftermath of Liz’s death and how it has affected everyone, particularly Red. The Blacklist airs on NBC on Thursday nights. Are you guys excited for some new devious blood to enter Red’s life?